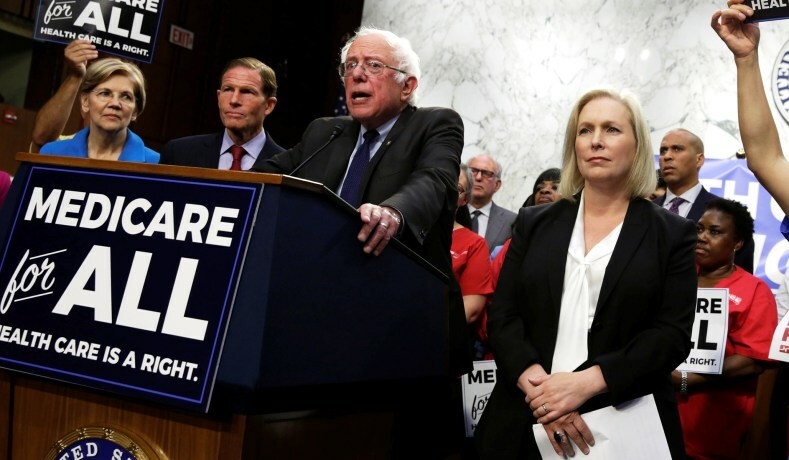 Reducing the insurance industry to rubble in an effort to curb profits that Sanders considers obscene is a bit like burning down the house to rid the living room of a mouse, or cutting off your nose to spite the fly on it. For the thoroughgoing socialist however, all profits, exorbitant or not, are obscene. The two socialist autocrats in Venezuela, Hugo Chavez and Nicolás Maduro, nationalized profits and, a few years after socialist hero Chavez had assumed room temperature, toilet paper in Venezuela disappeared, as did food and medicine. Disappearing products and services in perfected socialist states are replaced with armed soldiers, a disarmed populace, brown shirts and fists, not to mention draconian punishments for anyone who presumes to question an omnipotent and omnipresent state. Sanders is a socialist by trade and inclination, and socialists abhor company profits, without which industries could not stay in business. Adolf Hitler, a white national socialist, solved the profit problem by incorporating businesses into his fascist program. Like communism, fascism is a perfection of the socialist idea. Both Hitler and Mussolini were socialists before they settled comfortably into fascism. Mussolini perfectly defined the fascist credo in the following terms: “Everything in the state, nothing outside the state, nothing above the state.” He might easily have been describing Stalin’s Russia, or Maduro’s Venezuela, or the future utopia of Bernie Sanders. Mussolini certainly was not describing the average conservative/libertarian view of the proper role of government, which is to pursue policies that promote the general welfare – not the same thing as imprisoning the general populace in welfare penitentiaries. The perfecting of Sanders’ socialist scheme necessitates a hostile takeover of the insurance industry by the socialist administrative state. But this is only the beginning. If insurance profits are verboten to committed socialists, why should the energy industry, also profitable, survive the attentions of Sanders/Blumenthal, or the real estate industry, Blumenthal’s own golden goose? Indeed, why not nationalize every profitable industry? It might be useful to attempt an understanding of why Blumenthal, a Greenwich millionaire many times over, supports a scheme of government that will run insurance companies out of Connecticut and the nation. Theories abound. One holds that Blumenthal has never had a handle on how the private marketplace really works. After marrying the daughter of a New York real-estate mogul – Blumenthal’s in-laws own the Empire State building, in addition to other prime holdings – the Harvard/Yale graduate went directly into Connecticut politics. As Attorney General of the state for two decades, Blumenthal used businesses as a foil to ingratiate himself with the voting public and a fawning state media, both equally indispensable to his acquisition of political position and power. Blumenthal is now schmoozing with Sanders, so the theory goes, to further his own political ambitions. Even Bill and Hillary Clinton, life-long friends of Blumenthal, had great difficulty keeping down Sanders’ elixir. The second theory goes like this: The National Democrat Party is playing with the economic DNA of the United States – only for political (read: campaign) reasons. Seizing the profits generated by a still relatively free marketplace in the United States, encumbering it with unsupportable taxes and regulations, may not advance the general good, but it certainly helps to improve the lot of political destructors-elect. Socialist Maduros of the world live in opulent splendor, while the people who struggle under Maduro’s socialist rule in Venezuela, once the pearl of Latin America, are forced to search through garbage bins for their lunch. In Blumenthal’s case, both theories may be true -- not that truth has anything to do with the daily operations of political shysters.